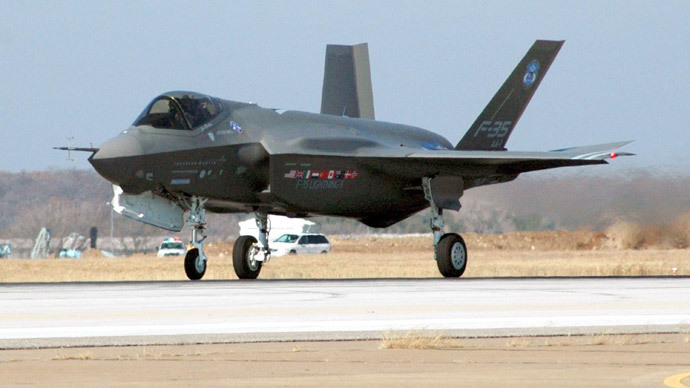 The reported theft by Chinese hackers of blueprints for the US’s F-35 Joint Strike Fighter amounted to 50 terabytes of classified information, documents leaked by NSA whistleblower Edward Snowden have revealed. The hackers are believed by many US officials to be affiliated with the Chinese government. The humiliating 2007 incident saved China “25 years of research and development,” according to a US military official cited by The Washington Post in a 2013 article covering the breach. Previous media reports said “several terabytes” of data was stolen, but according to the new documents published by the German magazine Der Spiegel last week, the actual amount was far higher, at 50 terabytes –the equivalent of five Libraries of Congress. The data – reportedly used by China to build their own advanced fighter jets – includes detailed engine schematics and radar design. Beijing dismissed the allegations of data theft in the wake of Snowden’s revelation. "The so-called evidence that has been used to launch groundless accusations against China is completely unjustified," Foreign Ministry spokesman Hong Lei told reporters, adding that "according to the materials presented by the relevant person, some countries themselves have disgraceful records on cyber security." F-35 blueprints are just a fraction of what Chinese hackers have allegedly stolen from the Pentagon’s data vaults over the years. The reported haul includes some two dozen advanced weapon systems, including the AEGIS Ballistic Missile Defense System, Littoral Combat Ship designs and emerging railgun technology, a classified report revealed in 2013. Edward Snowden, a former NSA employee, leaked thousands of classified documents to various media outlets in 2013. The focus of the leaks was on massive electronic surveillance programs by the agency and its allies across the globe. The US government wants to prosecute Snowden for espionage, but for many he is a heroic figure standing up for privacy and government transparency. He is currently living in Russia, which granted him political asylum after he was stranded in a Moscow airport when the US revoked his passport.